WAnt a Tree? ..... Sign Up! Don't Want a Tree? ...... OPT OUT!! Get Ready for the October 14th Planting! Click to upload complete list. Street trees soften noise, slow winds, clear carbon dioxide from the air and add to the appearance and value of a neighborhood. Who doesn’t prefer to stroll down a tree-lined street? But it has been challenging to make sense of the crazy quilt of street tree responsibilities in San Francisco. Certain main streets – Lombard on Telegraph Hill, Folsom on the edge of the Mission – were beautified by the City, most during the 1970s and 80s, and the City continued to maintain them. All other trees were the responsibility of the adjacent property owner. Ballot Proposition E, passed by San Francisco voters in November 2016, allocates $19M per year from the City’s General Fund for the maintenance of City street trees. With the passage of Prop E ALL street trees in the City became the responsibility of Public Works – including pruning and repair of tree-related sidewalk damage. Friends of the Urban Forest, the nonprofit founded in 1981 that has added over 50,000 trees in San Francisco, is, in parallel to City maintenance efforts, continuing its mission to add street trees to City sidewalks. This October 14, FUF will do a planting in the Green Benefit District. 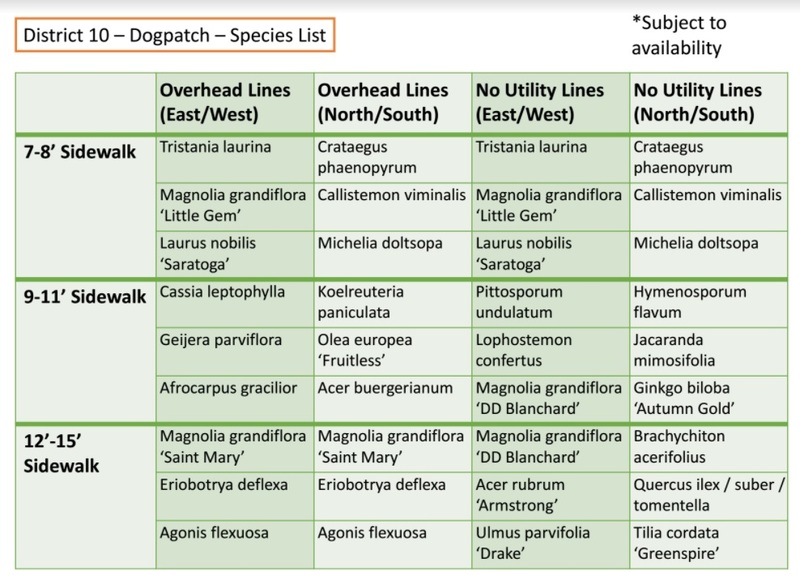 As many as 80 new trees will be added to Dogpatch and NW Potrero Hill at no cost to residents. A second planting will add another 80 trees in the surrounding area. Following the passage of Prop E, a City survey established each qualified sidewalk location as a future street tree site. The City plans to plant a tree at every legal site as part of the San Francisco Urban Forest Plan. FUF, as a courtesy to District property owners, is allowing neighbors to opt out of the Dogpatch & NW Potrero Hill planting if FUF is notified by September 1, 2017. To make sure you get a tree, or don’t get one, property owners should fill out the Street Tree Planting Response Card on the FUF website. How do I get a tree in front of my building? FUF will do all the work – checking for underground utilities, getting permits, cutting the sidewalk and delivering the trees. But please volunteer for the October 14, 2017 planting. Whether you get a tree of not, you can help green our District! If your building is within the GBD (check GBD boundaries) and your sidewalk meets the requirements for having a street tree, one will probably be planted there on October 14. If you are the property owner and want to make sure you get a tree, fill out a Street Tree Planting Response Card at the Friends of the Urban Forest website. If you are a tenant, encourage your landlord to participate. Can I choose what kind of tree I get? Yes. FUF arborists will recommend street trees particularly suited to our District. If you sign up to make sure you get a tree, you will receive an invitation to choose your tree from that list before the October planting. If you sign up but do not notify FUF of your selection before the planting or you do not sign up to get a tree but there is a plantable location near you, FUF will select a species for your location. You can learn more about street trees at FUF’s City-wide Tree Species Directory. what if I am not available on October 14? FUF and the GBD can still plant your tree. Do you have friends or family that can volunteer to help plant? Are these new trees free? The trees and all the steps before planting (utility survey, sidewalk cutting and concrete removal, tree delivery) and after (pruning, tree-related sidewalk repair) are at no cost to property owners. If you have any citations or other notices from the City related to your sidewalk or existing street tree you must clear them up before October 1 for a new tree to be planted. Can I get a tree for my yard? No. This planting is only for street trees planted in the public right of way. What if I don't want a Tree? Property owners that DO NOT WANT A TREE must actively opt out of the planting BEFORE SEPTEMBER 1, 2017 by going to the FUF website and filling out a Tree Planting Response Card. what if I want to take care of my new tree myself? If you elect to maintain the tree yourself, you are advised to use a licensed arborist to care for your tree. Your tree care plan must meet City regulations. The City tree maintenance program is still in development, so the process for opting out of City care has not yet been established. can I get a tree if I have abasin already but it is empty? Yes. If your building is located within the GBD and you have a clear and empty tree basin, it will probably be replanted on October 14. Property owners can make sure to get a tree and have the opportunity to select the type of tree by filling out a Tree Planting Response Card on the FUF website. If there is a stump or any remaining root balls in the basin, they will have to removed prior to October 1 for a new tree to be planted there. FUF is not able to offer stump removals for the October 14 planting. You can remove the stump yourself, or use a licensed contractor. what if my old street tree is dead. Can it be replaced? If the City has issued you a removal notice prior to July 1, 2017, you are still responsible for removing and replacing your dead tree at your own cost. If you do this prior to October 1, including having the root ball ground out, we can replant your basin. If you have not received any notice in the past, the City is now responsible for removing your dead tree. You should make a 311 request to have your tree removed by the City. Please note, though, that the programs required by Prop E are just starting. It may be a few years before our District is scheduled for tree removals and maintenance. who is responsible if the new tree does not make it? The primary cause of failure in new street trees is a lack of water. A watering plan will be determined prior to the planting. If your new tree dies, FUF or the City will determine the cause of death. FUF can replace your tree without cost to you if the tree experienced substantial stock during the planting or there was a nursery quality issue noted by our staff that may have caused the loss. Please cotact FUF at treecare@fuf.net if you notice the tree is failing.